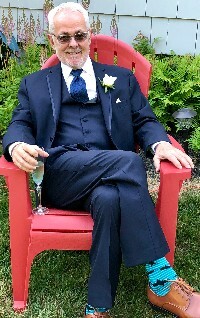 Westbrook, ME - Timothy M. Crellin, born in Detroit, MI, passed away peacefully at his home on July 28, 2018 after years of battling Parkinson’s Disease. Tim was the beloved husband and life partner of Tina Crellin for 28 years. He is survived by his sons, Matthew Crellin, Sean Crellin, and Ryan Dumond; daughter, Jamie Dumond; and brothers, Charles Crellin and David Crellin. A longtime resident of Westbrook, ME, Tim lived in various places across the US and traveled extensively throughout his life. He was equally at home whether he was in Dallas, Santa Barbara, Maui, June Lake, Anchorage or Westbrook. Tim had a love of life and a passion for things he believed strongly in. He was a man of many adventures which led him down numerous career paths and endeavors. From Heli shot fire crew member in CA, surfer in Hawaii, executive career consultant, stay-at-home Dad for his children, Westbrook School Board Member for 8 years, equal rights advocate, to avid animal rescuer, Tim loved and lived it all to the fullest. Donations in Tim’s name to the Animal Refuge League of Greater Portland and the Maine Parkinson Society are welcome and appreciated. Per Tim’s wishes, no services will be held. Instead, a private celebration of his life for family and friends will take place at a later date.